This chapter describes the most important components of the multitenant architecture. A container is a collection of schemas, objects, and related structures in a multitenant container database (CDB). Within a CDB, each container has a unique ID and name. In a CDB, every user, role, or object is either common or local. Similarly, a privilege is granted either commonly or locally. Within an application container, an application is the named, versioned set of common data and metadata stored in the application root. Clients must connect to PDBs or application roots using services. A CDB has the same structure as a non-CDB, except that each PDB and application root has its own set of tablespaces, including its own SYSTEM, SYSAUX, and undo tablespaces. Many availability features that exist for a non-CDB also exist for individual PDBs within a CDB. Using Oracle Resource Manager (Resource Manager), you can create CDB resource plans and set initialization parameters to allocate resources to PDBs. The CDB root, also called simply the root, is a collection of schemas, schema objects, and nonschema objects to which all PDBs belong. A PDB is a user-created set of schemas, objects, and related structures that appears logically to a client application as a separate database. From the user and application perspective, the data dictionary in each container in a CDB is separate, as it would be in a non-CDB. For a given session, the current container is the one in which the session is running. The current container can be the CDB root, an application root, or a PDB. A cross-container operation is a DDL or DML statement that affects multiple containers at once. 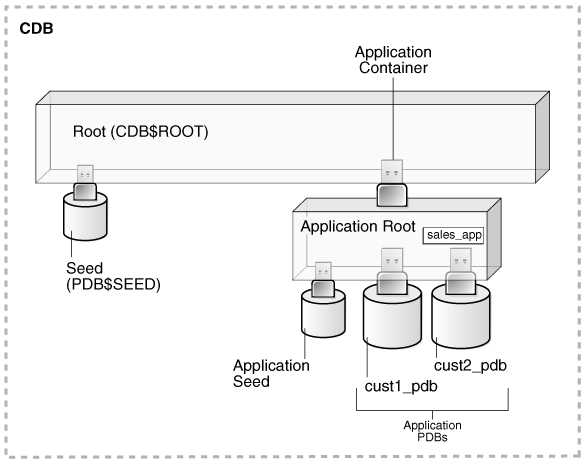 Every CDB has one and only one root container named CDB$ROOT. The root stores the system metadata required to manage PDBs. All PDBs belong to the root. The system container is the CDB root and all PDBs that belong to this root. The CDB root does not store user data. Oracle recommends that you do not add common objects to the root or modify Oracle-supplied schemas in the root. However, you can create common users and roles for database administration. A common user with the necessary privileges can switch between containers. Oracle recommends AL32UTF8 for the root character set. PDBs with different character sets can reside in the same CDB without requiring character set conversion. The following query, issued by an administrative user connected to the CDB root, lists all containers in the CDB (including the seed and CDB root), ordered by CON_ID. "Common Users in a CDB"
Every PDB is owned by SYS, regardless of which user created the PDB. SYS is a common user in the CDB. 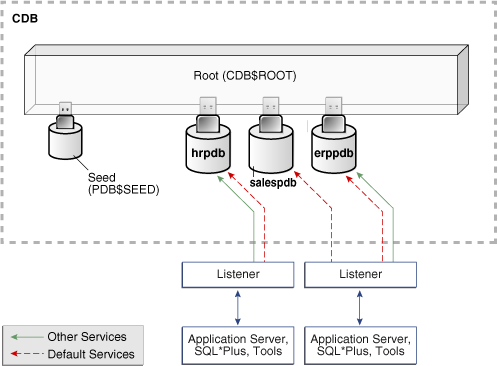 All PDBs are user-created with the CREATE PLUGGABLE DATABASE statement except for PDB$SEED, which is Oracle-supplied. From the point of view of an application, a PDB is a self-contained, fully functional Oracle database. You can consolidate PDBs into a single CDB to achieve economies of scale, while maintaining isolation between PDBs. A proxy PDB refers to a remote PDB, called the referenced PDB. Containers in a CDB share the same namespace, which means that they must have unique names within this namespace. By default, a user connected to one PDB must use database links to access objects in a different PDB. This behavior is directly analogous to a user in a non-CDB accessing objects in a different non-CDB. You can create the following types of PDBs. This PDB belongs to the CDB root container and not an application container. This type of PDB cannot use application common objects. See "Application Common Objects". An application PDB belongs to exactly one application container. Unlike PDBs plugged in to the CDB root, application PDBs can share a master application definition within an application container. For example, a usa_zipcodes table in an application root might be a data-linked common object, which means it contains data accessible by all application PDBs plugged in to this root. PDBs that do not reside within the application container cannot access its application common objects. A refreshable clone PDB is a read-only clone of a source PDB that can receive incremental changes from a source PDB. You can configure the clone PDB to receive the changes automatically or only manually. A snapshot copy PDB is created using a storage-level snapshot. Unlike a standard PDB clone, a snapshot copy PDB cannot be unplugged. Consider an application root as an application-specific root container. It serves as a repository for a master definition of an application back end, including common data and metadata. To create an application root, connect to the CDB root and specify the AS APPLICATION CONTAINER clause in a CREATE PLUGGABLE DATABASE statement. See "Application Root". You can use this system-supplied template to create new PDBs either in an application container or the system container. The system container contains exactly one PDB seed. You cannot drop PDB$SEED, or add objects to or modify objects within it. To accelerate creation of application PDBs within an application container, you can create an optional application seed. An application container contains either zero or one application seed. You create an application seed by connecting to the application container and executing the CREATE PLUGGABLE DATABASE ... AS SEED statement. See "Application Seed". A proxy PDB is a PDB that uses a database link to reference a PDB in a remote CDB. When you issue a statement in a proxy PDB while the PDB is open, the statement executes in the referenced PDB. You must create a proxy PDB while connected to the CDB root or application root. You can alter or drop a proxy PDB just as you can a standard PDB. For example, a sales application can have its own dedicated PDB, and a human resources application can have its own dedicated PDB. Alternatively, you can create an application container, which is a named collection of PDBs, to store an application back end containing common data and metadata (see "About Application Containers"). A database is "pluggable" because you can package it as a self-contained unit, called an unplugged PDB, and then move it into another CDB. You can unplug a PDB from CDB at a lower Oracle Database release, and then plug it in to a CDB at a higher release. For testing and development, you can clone a PDB while it remains open, storing the clone in the same or a different CDB. Optionally, you can specify the PDB as a refreshable clone PDB. Alternatively, you use the Oracle-supplied seed PDB or a user-created application seed to copy new PDBs. You can create a proxy PDB that refers to a different PDB, either in the same CDB or in a separate CDB. When you issue statements in the proxy PDB, they execute in the referenced PDB. A local or common user with appropriate privileges can grant EXECUTE privileges on a schema object to PUBLIC within an individual PDB. "Benefits of the Multitenant Architecture"
Although you issue SQL statements in the proxy (referring) PDB, the statements execute in the referenced PDB. In this respect, a proxy PDB is loosely analogous to a symbolic link file in Linux. Proxy PDBs enable you to build location-transparent applications that can aggregate data from multiple sources. These sources can be in the same data center or distributed across data centers. Assume that CDBs cdb_prod and cdb_test have the same application model. You create a proxy PDB in an application container in cdb_prod that refers to an application root in cdb_test. When you run installation and upgrade scripts in the application root in cdb_prod, Oracle Database propagates these statements to the proxy PDB, which in turn sends them remotely to the application root in cdb_test. In this way, the application root in cdb_test becomes a replica of the application root in cdb_prod. To create a proxy PDB, execute CREATE PLUGGABLE DATABASE with the AS PROXY FROM clause, where FROM specifies the referenced PDB name and a database link. The creation statement copies only the data files belonging to the SYSTEM and SYSAUX tablespaces. This example connects to the container saas_sales_ac in a local production CDB. The sales_admin common user creates a proxy PDB named sales_sync_pdb. This application PDB references an application root named saas_sales_test_ac in a remote development CDB, which it accesses using the cdb_dev_rem database link. When an application upgrade occurs in saas_sales_ac in the production CDB, the upgrade automatically propagates to the application root saas_sales_test_ac in the remote development CDB. For example, if the same CDB contains the application containers saas_sales_ac and saas_sales_test_ac, then two application PDBs that are both named cust1 cannot simultaneously reside in both containers. The namespace rules also prevent creation of a PDB named cust1pdb in the CDB root and a PDB named cust1pdb in an application root. PDBs and application root containers must follow the same naming rules as service names. Moreover, because a PDB or application root has a service with its own name, the container name must be unique across all CDBs whose services are exposed through a specific listener. The first character of a user-created container name must be alphanumeric, with remaining characters either alphanumeric or an underscore (_). Because service names are case-insensitive, container names are case-insensitive, and are in upper case even if specified using delimited identifiers. "General Prerequisites for PDB Creation"
In this illustration, a PDB administrator is connected to the PDB named hrpdb1. By default, during this user session, c##dba cannot query the emp2 table in hrpdb2 without specifying a database link. Description of "Figure 2-1 Database Link Between PDBs"
A data-linked common object, which is accessible by all application PDBs that contain a data link that points to this object. For example, the application container saas_sales_ac might contain the data-linked table usa_zipcodes within its application. In this case, common CDB user c##dba can connect to an application PDB in this container, and then query usa_zipcodes even though the actual table resides in the application root. In this case, no database link is required. The CONTAINERS() clause in SQL issued from the CDB root or application root. Using this clause, you can query data across all PDBs plugged in to the root. When creating a proxy PDB, you must specify a database link name in the FROM clause of the CREATE PLUGGABLE DATABASE ... AS PROXY statement. If the proxy PDB and referenced PDB reside in separate CDBs, then the database link must be defined in the root of the CDB that will contain the proxy PDB. The database link must connect either to the remote referenced PDB or to the CDB root of the remote CDB. "Overview of Common and Local Objects in a CDB"
For example, the DBA_OBJECTS view in each PDB can show a different number of rows. This dictionary separation enables Oracle Database to manage the PDBs separately from each other and from the root. In a newly created non-CDB that does not yet contain user data, the data dictionary contains only system metadata. For example, the TAB$ table contains rows that describe only Oracle-supplied tables, for example, TRIGGER$ and SERVICE$. The CDB uses an internal linking mechanism to separate data dictionary information. A container data object is a table or view containing data pertaining to multiple containers or the whole CDB. The data dictionary that stores the metadata for the CDB as a whole is stored only in the system tablespaces. The following graphic depicts three underlying data dictionary tables, with the red bars indicating rows describing the system. Description of "Figure 2-2 Unmixed Data Dictionary Metadata in a Non-CDB"
If users create their own schemas and tables in this non-CDB, then the data dictionary now contains some rows that describe Oracle-supplied entities, and other rows that describe user-created entities. For example, the TAB$ dictionary table now has a row describing employees and a row describing departments. Description of "Figure 2-3 Mixed Data Dictionary Metadata in a Non-CDB"
In a CDB, the data dictionary metadata is split between the root and the PDBs. In the following figure, the employees and departments tables reside in a PDB. The data dictionary for this user data also resides in the PDB. Thus, the TAB$ table in the PDB has a row for the employees table and a row for the departments table. Description of "Figure 2-4 Data Dictionary Architecture in a CDB"
For example, instead of storing the source code for the DBMS_ADVISOR PL/SQL package in every PDB, the CDB stores it only in CDB$ROOT, which saves disk space. If the definition of a data dictionary table existed in every PDB, and if the definition were to change in a new release, then each PDB would need to be upgraded separately to capture the change. Storing the table definition only once in the root eliminates this problem. Oracle Database stores metadata about dictionary objects only in the CDB root. For example, the column definitions for the OBJ$ dictionary table, which underlies the DBA_OBJECTS data dictionary view, exist only in the root. As depicted in Figure 2-4, the OBJ$ table in each PDB uses an internal mechanism called a metadata link to point to the definition of OBJ$ stored in the root. The data corresponding to a metadata link resides in its PDB, not in the root. For example, if you create table mytable in hrpdb and add rows to it, then the rows are stored in the PDB data files. The data dictionary views in the PDB and in the root contain different rows. For example, a new row describing mytable exists in the OBJ$ table in hrpdb, but not in the OBJ$ table in the CDB root. Thus, a query of DBA_OBJECTS in the CDB root and DBA_OBJECTS in hrdpb shows different results. Data links were called object links in Oracle Database 12c Release 1 (12.1.0.2). In some cases, Oracle Database stores the data (not only metadata) for an object only once in the application root. An application PDB uses an internal mechanism called a data link to refer to the objects in the application root. The application PDB in which the data link was created also stores the data link description. A data link inherits the data type of the object to which it refers. An extended data link is a hybrid of a data link and a metadata link. Like a data link, an extended data link refers to an object in an application root. However, the extended data link also refers to a corresponding object in the application PDB. Like a metadata link, the object in the application PDB inherits metadata from the corresponding object in the application root. When queried in the application root, an extended data-linked object fetches rows only from the application root. However, when queried in an application PDB, an extended data-linked object fetches rows from both the application root and application PDB. 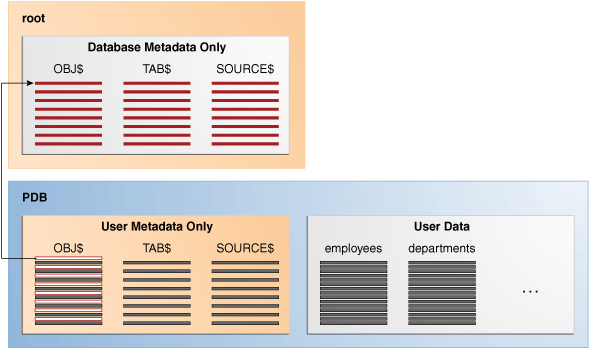 Oracle Database automatically creates and manages metadata and data links to CDB$ROOT. Users cannot add, modify, or remove these links. Container data privileges support a general requirement in which multiple PDBs reside in a single CDB, but with different local administration requirements. For example, if application DBAs do not want to administer locally, then they can grant container data privileges on appropriate views to the common users. In this case, the CDB administrator can access the data for these PDBs. In contrast, PDB administrators who do not want the CDB administrator accessing their data do not grant container data privileges. Examples of container data objects are Oracle-supplied views whose names begin with V$ and CDB_. All container data objects have a CON_ID column. The following table shows the meaning of the values for this column. Description of "Figure 2-5 Dictionary Views in a CDB"
When the current container is a PDB, a user can view data dictionary information for the current PDB only. To an application connected to a PDB, the data dictionary appears as it would for a non-CDB. When the current container is the root, however, a common user can query CDB_ views to see metadata for the root and for PDBs for which this user is privileged. When queried from the root container, CDB_ and V$ views implicitly convert data to the AL32UTF8 character set. If a character set needs more bytes to represent a character when converted to AL32UTF8, and if the view column width cannot accommodate data from a specific PDB, then data truncation is possible. The following table shows a scenario involving queries of CDB_ views. Each row describes an action that occurs after the action in the preceding row. 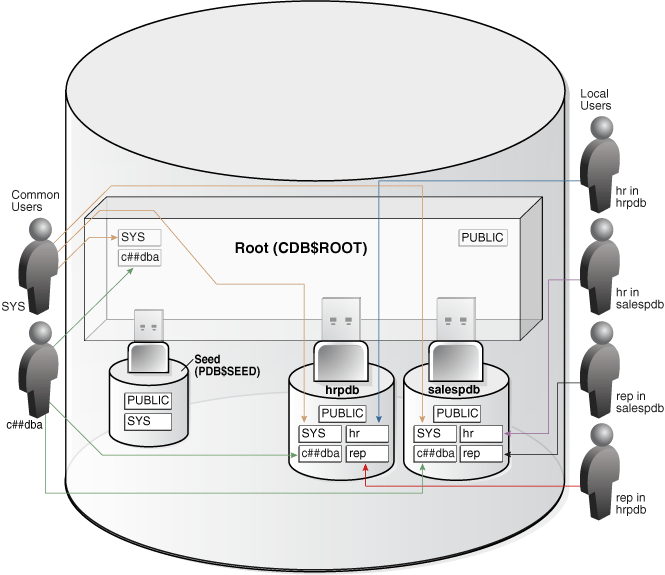 The SYSTEM user, which is common to all containers in the CDB, connects to the root (see "Common Users in a CDB"). SYSTEM queries CDB_USERS to obtain the number of common users in the CDB. The output indicates that 41 common users exist. SYSTEM queries CDB_USERS to determine the number of distinct containers in the CDB. The SYSTEM user now connects to the PDB named hrpdb. SYSTEM queries CDB_USERS. The output indicates that 45 users exist. Because SYSTEM is not connected to the root, the CDB_USERS view shows the same output as DBA_USERS. Because DBA_USERS only shows the users in the current container, it shows 45. The data dictionary that stores the metadata for a specific PDB is stored in the self-contained tablespaces dedicated to this PDB. The PDB tablespaces contain both the data and metadata for an application back end. Thus, each set of data dictionary tables is stored in its own dedicated set of tablespaces. Each session has exactly one current container at any point in time. Because the data dictionary in each container is separate, Oracle Database uses the data dictionary in the current container for name resolution and privilege authorization. Examples of cross-container DDL operations include user SYSTEM granting a privilege commonly to another common user (see "Roles and Privileges Granted Commonly in a CDB"), and an ALTER DATABASE . . . RECOVER statement that applies to the entire CDB. When you are connected to either the CDB root or an application root, you can execute a single DML statement to modify tables or views in multiple PDBs within the container. The database infers the target PDBs from the value of the CON_ID column specified in the DML statement. If no CON_ID is specified, then the database uses the CONTAINERS_DEFAULT_TARGET property specified by the ALTER PLUGGABLE DATABASE CONTAINERS DEFAULT TARGET statement. In the preceding UPDATE statement, sal is an alias for CONTAINERS(sh.sales). A common phenomenon defined in a root is the same in all containers plugged in to this root. If a user account owns objects that define the database, then this user account is common. User accounts that are not Oracle-supplied are either local or common. User-created roles are either local or common. Common roles are either common to the CDB itself or to a specific application container. Just as in a non-CDB, users in a CDB can grant and be granted roles and privileges. Roles and privileges in a CDB, however, are either locally or commonly granted. A common object is defined in either the CDB root or an application root, and can be referenced using metadata links or object links. A local object is every object that is not a common object. For both mixed mode and unified auditing, a common audit configuration is visible and enforced across all PDBs. A PDB lockdown profile is a named set of features that control operations available to users connected to a PDB. For example, a PDB lockdown profile can disable privileges that come with the ALTER SYSTEM statement. In a CDB, a phenomenon can be common within either the system container (the CDB itself), or within a specific application container. In a CDB, the namespace for every object is scoped to its container. For example, if you create a common user account while connected to CDB$ROOT, then this user account is common to all PDBs and application roots in the CDB. If you create an application common user account while connected to an application root, however, then this user account is common only to the PDBs in this application container. A common phenomenon is the same in every existing and future container. Therefore, a common user defined in the CDB root has the same identity in every PDB plugged in to the CDB root; a common user defined in an application root has the same identity in every application PDB plugged in to this application root. In contrast, a local phenomenon is scoped to exactly one existing container. Only a common user can alter the existence of common phenomena. More precisely, only a common user logged in to either the CDB root or an application root can create, destroy, or modify attributes of a user, role, or object that is common to the current container. From an application perspective, a PDB is indistinguishable from a non-CDB. Local phenomena are created within and restricted to a single container. Common phenomena are defined in a CDB root or application root, and exist in all PDBs that are or will be plugged into this root. The preceding principles have implications for local and common phenomena. A local phenomenon must be uniquely named within a container, but not across all containers in the CDB. Identically named local phenomena in different containers are distinct. For example, local user sh in one PDB does not conflict with local user sh in another PDB. Common phenomena defined in CDB$ROOT exist in multiple containers and must be unique within each of these namespaces. For example, the CDB root includes predefined common users such as SYSTEM and SYS. To ensure namespace separation, Oracle Database prevents creation of a SYSTEM user within another container. To ensure namespace separation, the name of user-created common phenomena in the CDB root must begin with the value specified by the COMMON_USER_PREFIX initialization parameter. The default prefix is c## or C##. The names of all other user-created phenomena must not begin with c## or C##. For example, you cannot create a local user in hrpdb named c##hr, nor can you create a common user in the CDB root named hr. Within an application container, names for local and application common phenomena must not conflict. The same principles apply to application common users as to CDB common users. The difference is that for CDB common users, the default value for the common user prefix is c## or C##, whereas in application root the default value for the common user prefix is the empty string. The multitenant architecture assumes that you create application PDBs from an application root, or convert a single-tenant application to a multitenant application. The multitenant architecture assumes that you create application common objects in the application root. Later, you add data locally within the application PDBs. However, Oracle Database supports creation of local tables within an application PDB. In this case, the local tables reside in the same namespace as application common objects within the application PDB. A CDB common user is a common user that is created in the CDB root. An application common user is a user that is created in an application root, and is common only within this application container. The following graphic shows the possible user account types in a CDB. 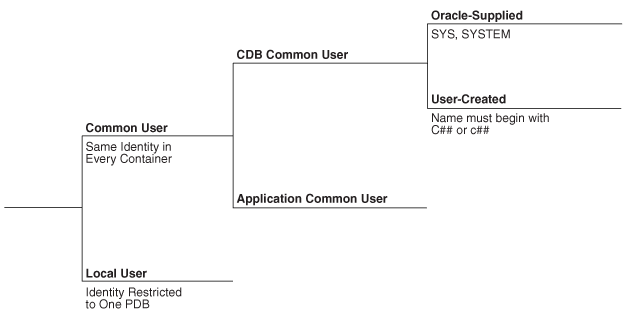 Description of "Figure 2-6 User Accounts in a CDB"
A CDB common user can connect to any container in the CDB to which it has sufficient privileges. In contrast, an application common user can only connect to the application root in which it was created, or a PDB that is plugged in to this application root, depending on its privileges. Within the context of either the system container (CDB) or an application container, a common user is a database user that has the same identity in the root and in every existing and future PDB within this container. A local user is a database user that is not common and can operate only within a single PDB. Every common user can connect to and perform operations within the root of its container, and within any PDB in which it has sufficient privileges. Some administrative tasks must be performed by a common user. Examples include creating a PDB and unplugging a PDB. For example, SYSTEM is a CDB common user with DBA privileges. Thus, SYSTEM can connect to the CDB root and any PDB in the database. You might create a common user saas_sales_admin in the saas_sales application container. In this case, the saas_sales_admin user could only connect to the saas_sales application root or to an application PDB within the saas_sales application container. Every common user is either Oracle-supplied or user-created. Examples of Oracle-supplied common users are SYS and SYSTEM. Every user-created common user is either a CDB common user, or an application common user. Figure 2-7 shows sample users and schemas in two PDBs: hrpdb and salespdb. SYS and c##dba are CDB common users who have schemas in CDB$ROOT, hrpdb, and salespdb. Local users hr and rep exist in hrpdb. Local users hr and rep also exist in salespdb. Description of "Figure 2-7 Users and Schemas in a CDB"
A common user can log in to any container (including CDB$ROOT) in which it has the CREATE SESSION privilege. A common user need not have the same privileges in every container. For example, the c##dba user may have the privilege to create a session in hrpdb and in the root, but not to create a session in salespdb. Because a common user with the appropriate privileges can switch between containers, a common user in the root can administer PDBs. An application common user does not have the CREATE SESSION privilege in any container outside its own application container. Thus, an application common user is restricted to its own application container. For example, the application common user created in the saas_sales application can connect only to the application root and the PDBs in the saas_sales application container. The names of user-created CDB common users must follow the naming rules for other database users. Additionally, the names must begin with the characters specified by the COMMON_USER_PREFIX initialization parameter, which are c## or C## by default. Oracle-supplied common user names and user-created application common user names do not have this restriction. No local user name may begin with the characters c## or C##. Every common user is uniquely named across all PDBs within the container (either the system container or a specific application container) in which it was created. A CDB common user is defined in the CDB root, but must be able to connect to every PDB with the same identity. An application common user resides in the application root, and may connect to every application PDB in its container with the same identity. A local user is specific to a PDB and may own a schema in this PDB. In Figure 2-7, local user hr on hrpdb owns the hr schema. On salespdb, local user rep owns the rep schema, and local user hr owns the hr schema. A local user can administer a PDB, including opening and closing it. A common user with SYSDBA privileges can grant SYSDBA privileges to a local user. In this case, the privileged user remains local. A local user in one PDB cannot log in to another PDB or to the CDB root. 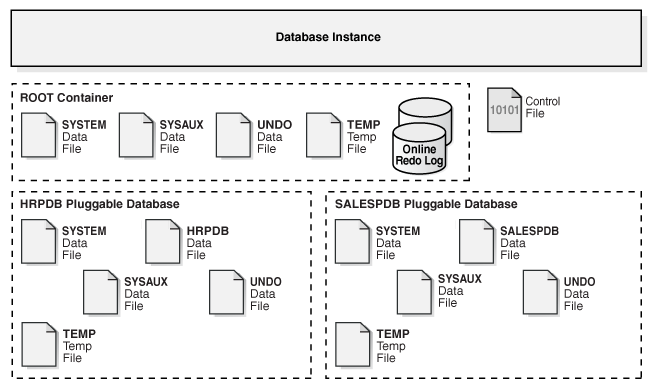 For example, when local user hr connects to hrpdb, hr cannot access objects in the sh schema that reside in the salespdb database without using a database link. In the same way, when local user sh connects to the salespdb PDB, sh cannot access objects in the hr schema that resides in hrpdb without using a database link. The name of a local user must not begin with the characters c## or C##. The name of a local user must only be unique within its PDB. The user name and the PDB in which that user schema is contained determine a unique local user. Figure 2-7 shows that a local user and schema named rep exist on hrpdb. A completely independent local user and schema named rep exist on the salespdb PDB. The following table describes a scenario involving the CDB in Figure 2-7. Each row describes an action that occurs after the action in the preceding row. Common user SYSTEM creates local users in two PDBs. SYSTEM connects to the hrpdb container using the service name hrpdb. SYSTEM now creates a local user rep and grants the CREATE SESSION privilege in this PDB to this user. The user is local because common users can only be created by a common user connected to the root. The rep user, which is local to hrpdb, attempts to connect to salespdb. The attempt fails because rep does not exist in PDB salespdb. This behavior mimics the behavior of non-CDBs. A user account on one non-CDB is independent of user accounts on a different non-CDB. SYSTEM connects to the salespdb container using the service name salespdb. SYSTEM creates a local user rep in salespdb and grants the CREATE SESSION privilege in this PDB to this user. Because the name of a local user must only be unique within its PDB, a user named rep can exist in both salespdb and hrpdb. The rep user successfully logs in to salespdb. Every Oracle-supplied role is common, for example, the predefined DBA role. In Oracle-supplied scripts, every privilege or role granted to Oracle-supplied users and roles is granted commonly, with one exception: system privileges are granted locally to the common role PUBLIC. A common role exists either in the CDB root or an application root, and applies to every PDB within the root container (either the CDB or the application container). A local role exists only in a single PDB, just as a role in a non-CDB exists only in the non-CDB. "Grants to PUBLIC in a CDB"
All Oracle-supplied roles, such as DBA and PUBLIC, are common to the CDB. Create a common role by executing CREATE ROLE ... CONTAINER=ALL in either the CDB root or application root, which determines the container to which the role is common. The standard naming conventions apply. Additionally, the names of CDB common roles must begin with the characters specified by the COMMON_USER_PREFIX initialization parameter, which are c## or C## by default. The scope of the role is the scope of the root within which it is defined. If you define the role in CDB$ROOT, then its scope is the entire CDB. If you define the role within application root, then its scope is the application container. A local role can only contain roles and privileges that apply within the container in which the role exists. For example, if you create the local role pdbadmin in hrpdb, then the scope of this role is restricted to this PDB. PDBs in the same CDB, or in the same application container, may contain local roles with the same name. For example, the user-created role pdbadmin may exist in both hrpdb and salespdb. However, these roles are completely independent of each other, just as they would be in separate non-CDBs. A privilege or role granted locally is exercisable only in the PDB in which it was granted. A privilege or role granted commonly is exercisable in every existing and future PDB in the container—either the CDB or an application container—in which it was granted. Users and roles may be common or local. However, a privilege is in itself neither common nor local. If a user grants a privilege locally using the CONTAINER=CURRENT clause, then the grantee has a privilege exercisable only in the current container. If a user connects to either the CDB root or an application root, and if this user grants a privilege commonly using the CONTAINER=ALL clause, then the grantee has this privilege in any existing or future PDB within the current container. In a CDB, every act of granting, whether local or common, occurs within a container. The container may be the CDB root, an application root, or a PDB. Roles and privileges may be granted locally to users and roles regardless of whether the grantees, grantors, or roles being granted are local or common. Privileges and common roles may be granted commonly. In a CDB, PUBLIC is a common role. In a PDB, privileges granted locally to PUBLIC enable all local and common user account to exercise these privileges in this PDB only. In this scenario, SYSTEM creates common user c##dba and tries to give this user privileges to query a table in the hr schema in hrpdb. If the current container is the CDB root, then granting commonly means granting to all containers in the CDB. If the current container is an application root, however, then granting commonly means granting to all PDBs in the current application container. Both common and local phenomena may grant and be granted locally. Only common phenomena may grant or be granted commonly. Local users, roles, and privileges are restricted to a particular PDB. Thus, local users may not grant roles and privileges commonly, and local roles and privileges may not be granted commonly. The following sections describe the implications of the preceding principles. The following table explains the valid possibilities for locally granted roles and privileges. Privileges in this role are available to the grantee only in the container in which the role was granted, regardless of whether the privileges were granted to the role locally or commonly. Privileges in this role are available to the grantee only in the container in which the role was granted and created. To grant a role or privilege locally, use the GRANT statement with the CONTAINER=CURRENT clause, which is the default. A user or role may be locally granted a privilege (CONTAINER=CURRENT). The grantor has the necessary privileges to grant the specified role or privileges. For system roles and privileges, the grantor must have the ADMIN OPTION for the role or privilege being granted. For object privileges, the grantor must have the GRANT OPTION for the privilege being granted. The grant applies to only one container. By default, the GRANT statement includes the CONTAINER=CURRENT clause, which indicates that the privilege or role is granted locally. In this example, both SYSTEM and c##hr_admin are common users. The example connects to hrpdb as SYSTEM (which has administrator privileges), and then locally grants read privileges on the employees table to c##hr_admin. This grant applies only to c##hr_admin within hrpdb, not within any other PDBs. For example, a READ ANY TABLE privilege granted locally to a local or common user in hrpdb applies only to this user in this PDB. Analogously, the READ ANY TABLE privilege granted to user hr in a non-CDB has no bearing on the privileges of an hr user that exists in a separate non-CDB. A user or role may be locally granted a role (CONTAINER=CURRENT). As shown in Table 2-4, a common role may receive a privilege granted locally. For example, the common role c##dba may be granted the READ ANY TABLE privilege locally in hrpdb. If the c##cdb common role is granted locally, then privileges in the role apply only in the container in which the role is granted. In this example, a common user who has the c##cdba role does not, because of a privilege granted locally to this role in hrpdb, have the right to exercise this privilege in any PDB other than hrpdb. User accounts or roles may be granted roles and privileges commonly only if the grantees and grantors are both common. If a role is being granted commonly, then the role itself must be common. The following table explains the possibilities for common grants. Privileges that were granted commonly to a common role are available to the grantee across all containers. In addition, any privilege granted locally to a common role is available to the grantee only in the container in which that privilege was granted to the common role. The CONTAINER=ALL clause specifies that the privilege or role is being granted commonly. A common user account or role may be granted a privilege commonly (CONTAINER=ALL). The user that performs the grant is either common to the CDB itself, or common to a specific application container. The grantee is a common user or common role. The recipient of the grant is either common to the CDB itself, or common to a specific application container. The grant applies to all PDBs within the container (either CDB or application container) in which the grant occurred. The GRANT statement includes a CONTAINER=ALL clause specifying that the privilege or role is granted commonly. If a role is being granted, then it must be common, and if an object privilege is being granted, then the object on which the privilege is granted must be common. In this example, both SYSTEM and c##hr_admin are common users. SYSTEM connects to the CDB root, and then grants the CREATE ANY TABLE privilege commonly to c##hr_admin. In this case, c##hr_admin can now create a table in any PDB in the CDB. Within the context of either the CDB root or an application root, the privilege is granted to this common user account or role in all existing and future PDBs within the current container. For example, if SYSTEM connects to the CDB root and grants a SELECT ANY TABLE privilege commonly to CDB common user account c##dba, then the c##dba user has this privilege in all PDBs in the CDB. A role or privilege granted commonly cannot be revoked locally. A user or role may receive a common role granted commonly. As mentioned in a footnote on Table 2-5, a common role may receive a privilege granted locally. Thus, a common user can be granted a common role, and this role may contain locally granted privileges. For example, the common role c##admin may be granted the SELECT ANY TABLE privilege that is local to hrpdb. Locally granted privileges in a common role apply only in the container in which the privilege was granted. Thus, the common user with the c##admin role does not have the right to exercise an hrpdb-contained privilege in salespdb or any PDB other than hrpdb. Every privilege and role granted to Oracle-supplied users and roles is granted commonly except for system privileges granted to PUBLIC, which are granted locally. This exception exists because you may want to revoke some grants included by default in Oracle Database, such as EXECUTE on the SYS.UTL_FILE package. Assume that local user account hr exists in hrpdb. This user locally grants the SELECT privilege on hr.employees to PUBLIC. Common and local users in hrpdb may exercise the privilege granted to PUBLIC. User accounts in salespdb or any other PDB do not have the privilege to query hr.employees in hrpdb. Privileges granted commonly to PUBLIC enable all local users to exercise the granted privilege in their respective PDBs and enable all common users to exercise this privilege in the PDBs to which they have access. Oracle recommends that users do not commonly grant privileges and roles to PUBLIC. The scenario shows how the CONTAINER clause affects grants of roles and privileges. The first column shows operations in CDB$ROOT. The second column shows operations in hrpdb. Common user SYSTEM connects to the root container. SYSTEM creates common user c##dba. The clause CONTAINER=ALL makes the user a common user. SYSTEM grants the CREATE SESSION system privilege to c##dba. Because the clause CONTAINER=ALL is absent, this privilege is granted locally and thus applies only to the root, which is the current container. SYSTEM creates a common role named c##admin. The clause CONTAINER=ALL makes the role a common role. SYSTEM grants the SELECT ANY TABLE privilege to the c##admin role. The absence of the CONTAINER=ALL clause makes the privilege local to the root. Thus, this common role contains a privilege that is exercisable only in the root. SYSTEM grants the c##admin role to c##dba. Because the CONTAINER=ALL clause is absent, the role applies only to the current container, even though it is a common role. If c##dba connects to a PDB, then c##dba does not have this role. c##dba fails to connect to hrpdb because the grant at t3 was local to the root. SYSTEM grants the CONNECT and RESOURCE roles to common user c##dba. Because the clause CONTAINER=ALL is absent, the grant is local to hrpdb. Common user c##dba connects to hrpdb. The query of hr.employees still returns an error because c##dba does not have select privileges on tables in hrpdb. The SELECT ANY TABLE privilege granted locally at t5 is restricted to the root and thus does not apply to hrpdb. SYSTEM grants the SELECT ANY TABLE privilege to the c##admin role. The presence of CONTAINER=ALL means the privilege is being granted commonly. A query of hr.employees still returns an error. The reason is that at t6 the c##admin common role was granted to c##dba in the root only. SYSTEM grants the common role named c##admin to c##dba, specifying CONTAINER=ALL. Now user c##dba has the role in all containers, not just the root. Database-supplied common objects are defined in CDB$ROOT and cannot be changed. Oracle Database does not support creation of common objects in CDB$ROOT. You can create most schema objects—such as tables, views, PL/SQL and Java program units, sequences, and so on—as common objects in an application root. If the object exists in an application root, then it is called an application common object. A local user can own a common object. Also, a common user can own a local object, but only when the object is not data-linked or metadata-linked, and is also neither a metadata link nor a data link. Audit configurations are either local or common. The scoping rules that apply to other local or common phenomena, such as users and roles, all apply to audit configurations. Audit initialization parameters exist at the CDB level and not in each PDB. Object auditing refers to audit configurations for specific objects. Only common objects can be part of the common audit configuration. A local audit configuration cannot contain common objects. A local audit policy applies to a single PDB. You can enforce local audit policies for local and common users in this PDB only. Attempts to enforce local audit policies across all containers result in an error. In all cases, enforcing of a local audit policy is part of the local auditing framework. A common audit policy applies to all containers. This policy can only contain actions, system privileges, common roles, and common objects. You can apply a common audit policy only to common users. Attempts to enforce a common audit policy for a local user across all containers result in an error. A common audit configuration is stored in the SYS schema of the root. A local audit configuration is stored in the SYS schema of the PDB to which it applies. Audit trails are stored in the SYS or AUDSYS schemas of the relevant PDBs. Operating system and XML audit trails for PDBs are stored in subdirectories of the directory specified by the AUDIT_FILE_DEST initialization parameter. A potential for elevation of privileges exists when PDBs share an identity. For example, identity can be shared at a network level, or when PDBs access common objects or connect through database links. To increase security, a CDB administrator may want to compartmentalize access, thereby restricting the operations that a user can perform in a PDB. A use case might be the creation of lockdown profiles at high, medium, and low levels. The high level might greatly restrict access, whereas the low level might enable access. For example, restrict access to UTL_HTTP or UTL_MAIL. For example, restrict operations in which a local user in a PDB can proxy through a common user or access objects in a common schema. For example, restrict access to the UTL_FILE or DBMS_FILE_TRANSFER PL/SQL packages. For example, you can restrict common users from connecting to the PDB or you can restrict a local user who has the SYSOPER administrative privilege from connecting to a PDB that is open in restricted mode. For example, you can restrict the use of ALTER SYSTEM, ALTER SESSION, and ALTER DATABASE. For example, you can use lockdown profiles to disable access to database options such as Oracle Partitioning or Oracle Database Advanced Queuing. FROM static_base_profile creates a new lockdown profile by using the values from an existing profile. Any subsequent changes to the existing profile will not affect the new profile. INCLUDING dynamic_base_profile creates a new lockdown profile by using the values from an existing profile, except that this new lockdown profile inherits the DISABLE STATEMENT rules that comprise the base profile, and any subsequent changes to the base profile. The user issuing the statement must have the CREATE LOCKDOWN PROFILE system privilege in the current container. You can add and remove restrictions with the ALTER LOCKDOWN PROFILE statement. The user must issue the ALTER statement in the CDB root or application root and must have the have ALTER LOCKDOWN PROFILE system privilege in the current container. The profile applies only to the PDB in which it is set. The profile applies to all application PDBs in the application container. The value can be modified only by an application common user who has application common SYSDBA or common ALTER SYSTEM privileges or a CDB common user who has common SYSDBA or common ALTER SYSTEM privileges. The profile applies to all PDBs. A common user who has common SYSDBA or common ALTER SYSTEM privileges can override a CDB-wide setting for a specific PDB. If the PDB_LOCKDOWN parameter in a PDB is set to the name of a lockdown profile different from the container for this PDB (CDB or application container), then a set of rules govern the interaction between restrictions. You can connect as the same common user to each PDB that requires this profile, and then use ALTER SYSTEM to set the PDB_LOCKDOWN initialization parameter to medium. For example, you could set PDB_LOCKDOWN to medium for hrpdb, but not salespdb. In this context of an application container, the term “application” means “master application definition.” For example, the application might include definitions of tables, views, and packages. An application container is an optional, user-created CDB component that stores data and metadata for one or more application back ends. A CDB includes zero or more application containers. An application common object is a common object created within an application in an application root. Common objects are either data-linked or metadata-linked. In this context, application maintenance refers to installing, uninstalling, upgrading, or patching an application. You can migrate an application that is installed in a PDB to either an application root or to an application PDB. In addition to user-created applications, application containers can also contain implicitly created applications. Within an application PDB, synchronization is the user-initiated update of the application to the latest version and patch in the application root. A container map enables a session connected to application root to issue SQL statements that are routed to the appropriate PDB, depending on the value of a predicate used in the SQL statement. "Creating and Removing Application Containers and Seeds"
For example, you might create multiple sales-related PDBs within one application container, with these PDBs sharing an application back end that consists of a set of common tables and table definitions. You might store multiple HR-related PDBs within a separate application container, with their own common tables and table definitions. The CREATE PLUGGABLE DATABASE statement with the AS APPLICATION CONTAINER clause creates the application root of the application container, and thus implicitly creates the application container itself. When you first create the application container, it contains no PDBs. To create application PDBs, you must connect to the application root, and then execute the CREATE PLUGGABLE DATABASE statement. In the CREATE PLUGGABLE DATABASE statement, you must specify a container name (which is the same as the application root name), for example, saas_sales_ac. The application container name must be unique within the CDB, and within the scope of all the CDBs whose instances are reached through a specific listener. Every application container has a default service with the same name as the application container. In some ways, an application container functions as an application-specific CDB within a CDB. An application container, like the CDB itself, can include multiple PDBs, and enables these PDBs to share metadata and data. An application container has exactly one application root, which is the parent of the application PDBs in the container. An application PDB is a PDB that resides in an application container. Every PDB in a CDB resides in either zero or one application containers. An application seed is an optional, user-created PDB within an application container. An application container has either zero or one application seed. "Overview of Applications in an Application Container"
The application root enables application PDBs to share an application, which in this context means a named, versioned set of common metadata and data. A typical application installs application common users, metadata-linked common objects, and data-linked common objects. Application containers provide several benefits over storing each application in a separate PDB. A SaaS deployment can use multiple application PDBs, each for a separate customer, that share metadata and data. A customer can use multiple application PDBs to address data sovereignty issues. The application root stores metadata and data that all application PDBs can share. For example, all application PDBs can share data in a central table, such as a table listed default application roles. Also, all PDBs can share a table definition to which they add PDB-specific rows. You maintain your master application definition in the application root, instead of maintaining a separate copy in each PDB. If you upgrade the application in the application root, then the changes are automatically propagated to all application PDBs. The application back end might contain the data-linked common object app_roles, which is a table that list default roles: admin, manager, sales_rep, and so on. A user connected to any application PDB can query this table. An application container can include an application seed, application PDBs, and proxy PDBs (which refer to PDBs in other CDBs). You can rapidly create new application PDBs from the application seed. You can query views that report on all PDBs in the application container. While connected to the application root, you can use the CONTAINERS function to perform DML on objects in multiple PDBs. For example, if the products table exists in every application PDB, then you can connect to the application root and query the products in all application PDBs using a single SELECT statement. You can unplug a PDB from an application root, and then plug it in to an application root in a higher Oracle database release. Thus, PDBs are useful in an Oracle database upgrade. In a pure SaaS environment, the master application definition resides in the application root, but the customer-specific data resides in its own application PDB. For example, sales_app is the application model in the application root. The application PDB named cust1_pdb contains sales data only for customer 1, whereas the application PDB named cust2_pdb contains sales data only for customer 2. Plugging, unplugging, cloning, and other PDB-level operations are available for individual customer PDBs. Description of "Figure 2-8 SaaS Use Case"
The data for each customer resides in its own container, but is consolidated so that you can manage many customers collectively. This model extends the economies of scale of managing many as one to the application administrator, not only the DBA. In a sample use case, a company puts data specific to each financial quarter in a separate PDB. For example, the application container named sales_ac includes q1_2016_pdb, q2_2016_pdb, q3_2016_pdb, and q4_2016_pdb. You define each transaction in the PDB corresponding to the associated quarter. To generate a report that aggregates performance across a year, you aggregate across the four PDBs using the CONTAINERS() clause. ETL for data specific to a single PDB does not affect the other PDBs. Execution plans are more efficient because they are based on actual data distribution. Like the CDB root, an application root serves as parent container to the PDBs plugged into it. When connected to the application root, you can manage common users and privileges, create application PDBs, switch containers, and issue DDL that applies to all PDBs in the application container. Like a PDB, you create an application root with the CREATE PLUGGABLE DATABASE statement, alter it with ALTER PLUGGABLE DATABASE, and change its availability with STARTUP and SHUTDOWN. You can use DDL to plug, unplug, and drop application roots. The application root has its own service name, and users can connect to the application root in the same way that they connect to a PDB. An application root differs from both the CDB root and standard PDB because it can store user-created common objects, which are called application common objects. Application common objects are accessible to the application PDBs plugged in to the application root. Application common objects are not visible to the CDB root, other application roots, or PDBs that do not belong to the application root. In this example, you log in to the CDB root as administrative common user c##system. You create an application container named saas_sales_ac, and then open the application root, which has the same name as the container. For example, the saas_sales_ac application container might support multiple customers, with each customer application storing its data in a separate PDB. The application PDBs cust1_sales_pdb and cust2_sales_pdb might reside in saas_sales_ac, in which case they belong to no other application container (although as PDBs they necessarily belong also to the CDB root). Create an application PDB by executing CREATE PLUGGABLE DATABASE while connected to the application root. You can either create the application PDB from a seed, or clone a PDB or plug in an unplugged PDB. Like a PDB that is plugged in to CDB root, you can clone, unplug, or drop an application PDB. However, an application PDB must always belong to an application root. An application seed enables you to create application PDBs quickly. It serves the same role within the application container as PDB$SEED serves within the CDB itself. The application seed name is always application_container_name$SEED, where application_container_name is the name of the application container. For example, use the CREATE PDB ... AS SEED statement to create saas_sales_ac$SEED in the saas_sales_ac application container. "Creating and Removing Application Seeds"
For a data-linked common object, application PDBs share a single set of data. For example, an application for the saas_sales_ac application container is named saas_sales_app, has version 1.0, and includes a data-linked usa_zipcodes table. In this case, the rows are stored once in the table in the application root, but are visible in all application PDBs. For a metadata-linked common object, application PDBs share only the metadata, but contain different sets of data. For example, a metadata-linked products table has the same definition in every application PDB, but the rows themselves are specific to the PDB. The application PDB named cust1pdb might have a products table that contains books, whereas the application PDB named cust2pdb might have a products table that contains auto parts. To create common objects, connect to an application root, and then execute a CREATE statement that specifies a sharing attribute. A metadata link is a dictionary object that supports referring to, and granting privileges on, common metadata shared by all PDBs in the application container. A data-linked object is an object whose metadata and data reside in an application root, and are accessible from all application PDBs in this application container. An extended data-linked object is a hybrid of a data-linked object and metadata-linked object. The setting is the default sharing attribute for all database objects of a supported type created in the root. You specify this clause in the CREATE statement itself. When a SHARING clause is included in a SQL statement, it takes precedence over the value specified in the DEFAULT_SHARING initialization parameter. Possible values are METADATA, DATA, EXTENDED DATA, and NONE. The following table shows the types of application common objects, and where the data and metadata is stored. Specifying the METADATA value in either the SHARING clause or the DEFAULT_SHARING initialization parameter specifies a link to an object’s metadata, called a metadata-linked common object. The metadata for the object is stored once in the application root. Tables, views, and code objects (such as PL/SQL procedures) can share metadata. In this context, “metadata” includes column definitions, constraints, triggers, and code. For example, if sales_mlt is a metadata-linked common table, then all application PDBs access the same definition of this table, which is stored in the application root, by means of a metadata link. The rows in sales_mlt are different in every application PDB, but the column definitions are the same. Typically, most objects in an application will be metadata-linked. Thus, you need only maintain one master application definition. This approach centralizes management of the application in multiple application PDBs. In this example, the SYSTEM user logs in to the saas_sales_ac application container. SYSTEM installs an application named saas_sales_app at version 1.0 (see "Application Maintenance"). This application creates a common user account named saas_sales_adm. The schema contains a metadata-linked common table named sales_mlt. You can use the ALTER PLUGGABLE DATABASE APPLICATION ... SYNC statement to synchronize the application PDBs to use the same master application definition. In this way, every application PDB has a metadata link to the saas_sales_adm.sales_mlt common table. The middle-tier code that updates sales_mlt within the PDB named cust1_pdb adds rows to this table in cust1_pdb, whereas the middle-tier code that updates sales_mlt in cust2_pdb adds rows to the copy of this table in cust2_pdb. Only the table metadata, which is stored in the application root, is shared. For metadata-linked application common objects, the metadata for the object is stored once in the application root. A metadata link is a dictionary object whose object type is the same as the metadata it is sharing. The description of a metadata link is stored in the data dictionary of the PDB in which it is created. A metadata link must be owned by an application common user. You can only use metadata links to share metadata of common objects owned by their creator in the CDB root or an application root. Unlike a data link, a metadata link depends only on common data. For example, if an application contains the local tables dow_close_lt and nasdaq_close_lt in the application root, then a common user cannot create metadata links to these objects. However, an application common table named sales_mlt may be metadata-linked. If a privileged common user changes the metadata for sales_mlt, for example, adds a column to the table, then this change propagates to the metadata links. Application PDB users may not change the metadata in the metadata link. For example, a DBA who manages the application PDB named cust1_pdb cannot add a column to sales_mlt in this PDB only: such metadata changes can be made only in the application root. Specifying the DATA value in either the SHARING clause or the DEFAULT_SHARING initialization parameter specifies a link to a common object, called a data-linked common object. Dimension tables in a data warehouse are often good candidates for data-linked common tables. A data link is a dictionary object that functions much like a synonym. For example, if countries is an application common table, then all application PDBs access the same copy of this table by means of a data link. If a row is added to this table, then this row is visible in all application PDBs. A data link must be owned by an application common user. The link inherits the object type from the object to which it is pointing. The description of a data link is stored in the dictionary of the PDB in which it is created. For example, if an application container contains 10 application PDBs, and if every PDB contains a link to the countries application common table, then all 10 PDBs contain dictionary definitions for this link. In this example, SYSTEM connects to the saas_sales_ac application container. SYSTEM upgrades the application named saas_sales_app from version 1.0 to 2.0. This application upgrade logs in to the container as common user saas_sales_adm, creates a data-linked table named countries_dlt, and then inserts rows into it. Use the ALTER PLUGGABLE DATABASE APPLICATION ... SYNC statement to synchronize application PDBs with the application root (see "Application Synchronization"). In this way, every synchronized application PDB has a data link to the saas_sales_adm.countries_dlt data-linked table. In an extended data-linked object, the data stored in the application root is common to all application PDBs, and all PDBs can access this data. However, each application PDB can create its own, PDB-specific data while sharing the common data in application root. Thus, the PDBs supplement the common data with their own data. For example, a sales application might support several application PDBs. All application PDBs need the postal codes for the United States. In this case, you might create a zipcodes_edt extended data-linked table in the application root. The application root stores the United States postal codes, so all application PDBs can access them. However, one application PDB requires the postal codes for the United States and Canada. This application PDB can store the postal codes for Canada in the extended data-linked object in the application PDB instead of in the application root. Create an extended data-linked object by connecting to the application root and specifying the SHARING=EXTENDED DATA keyword in the CREATE statement. In this example, SYSTEM connects to the saas_sales_ac application container, and then upgrades the application named saas_sales_app (created in "Example 2-8") from version 2.0 to 3.0. This application logs in to the container as common user saas_sales_adm, creates an extended data-linked table named zipcodes_edt, and then inserts rows into it. Use the ALTER PLUGGABLE DATABASE APPLICATION ... SYNC statement to synchronize application PDBs with the application (see "Application Synchronization"). In this way, every synchronized application PDB has a data link to the saas_sales_adm.zipcodes_edt data-linked table. Applications that connect to these PDBs can see the postal codes that were inserted into zipcodes_edt during the application upgrade, but can also insert their own postal codes into this table. Begin by executing the ALTER PLUGGABLE DATABASE ... APPLICATION statement with the BEGIN INSTALL, BEGIN UPGRADE, or BEGIN PATCH clauses. Execute statements to alter the application. End by executing the ALTER PLUGGABLE DATABASE ... APPLICATION statement with the END INSTALL, END UPGRADE, or END PATCH clauses. As the application evolves, the application container maintains all versions and patch changes. Perform application installation, upgrade, and patching operations using an ALTER PLUGGABLE DATABASE APPLICATION statement. An application installation is the initial creation of a master application definition. A typical installation creates user accounts, tables, and PL/SQL packages. An application upgrade is a major change to an installed application. An application patch is a minor change to an application. Log in to the application root. Begin the operation with an ALTER PLUGGABLE DATABASE APPLICATION ... BEGIN statement in the application root. Execute the application maintenance statements. End the operation with an ALTER PLUGGABLE DATABASE APPLICATION ... END statement. Perform the maintenance using scripts, SQL statements, or GUI tools. This example assumes that you are logged in to the application container named saas_sales_ac as. The example installs an application named saas_sales_app at version 1.0. Note that you specify the version with a string rather than a number. The application creates an application common user named saas_sales_adm, grants necessary privileges, and then connects to the application root as this user. This user creates a metadata-linked table named sales_mlt. PDB synchronization is the user-initiated update of an application PDB with the application in the application root. After you synchronize the application PDBs with the saas_sales_app application, each application PDB will contain an empty table named products_mlt. An application can connect to an application PDB, and then insert PDB-specific rows into this table. "Installing an Application in an Application Container with Automated Propagation"
Typically, an upgrade changes the physical architecture of the application. For example, an upgrade might add new user accounts, tables, and packages, or alter the definitions of existing objects. In this example, you connect to the application root as an administrator, and then upgrade the application saas_sales_app from version 1.0 to version 2.0. The upgrade creates a data-linked table named countries_dlt, and then adds rows to it. It also creates an extended data-linked table named zipcodes_edt, and then adds rows to it. During an application upgrade, the application remains available. To make this availability possible, Oracle Database clones the application root. Different application PDBs might use different versions of the application. "Upgrading Applications in an Application Container"
The following figure gives an overview of the application upgrade process. Description of "Figure 2-9 Application Upgrade"
In the initial state, the application root has an application in a specific version. The user executes the ALTER PLUGGABLE DATABASE APPLICATION BEGIN UPGRADE statement, and then issues the application upgrade statements. The clone is in read-only mode. The application remains available to the application PDBs. The user executes the ALTER PLUGGABLE DATABASE APPLICATION END UPGRADE statement. At this stage, the application PDBs are still pointing to the application root clone, and the original application root is at a new version. For example, if the saas_sales_app application is at version 1.0 in the application root, then the upgrade might bring it to version 2.0. The application root clone, however, remains at version 1.0. Optionally, the user synchronizes the application PDBs with the upgraded application root by issuing ALTER PLUGGABLE DATABASE APPLICATION statement with the SYNC clause. For example, after the synchronization, some application PDBs are plugged in to the application root at version 2.0. However, the application root clone continues to support application PDBs that must stay on version 1.0, or any new application PDBs that are plugged in to the application root at version 1.0. For example, one application PDB might have version 1.0 of the saas_sales_app. In the same application container, another application PDB has version 2.0 of this application. A use case is a SaaS application provided to different customers. If each customer has its own application PDB, then some customers might wait longer to upgrade the application. In this case, some application PDBs may use the latest version of the application, whereas other application PDBs use an older version. Typical examples of application patching include bug fixes and security patches. New functions and packages are permitted within a patch. In general, destructive operations are not permitted. For example, a patch cannot include DROP statements, or ALTER TABLE statements that drop a column or change a data type. Just as the Oracle Database patching process restricts the kinds of operations permitted in an Oracle Database patch, the application patching process restricts the operations permitted in an application patch. If a fix includes an operation that raises an “operation not supported in an application patch” error, then perform an application upgrade instead. You cannot patch an application when another application patch or upgrade is in progress. To patch the application, specify the application name and patch number in the ALTER PLUGGABLE DATABASE APPLICATION statement. Optionally, you can specify an application minimum version. In this example, SYSTEM logs in to the application root, and then patches the application saas_sales_app at version 1.0 or greater. Patch 101 logs in to the application container as saas_sales_adm, and then creates a metadata-linked PL/SQL function named get_total_revenue. "Patching Applications in an Application Container"
Some applications use an installation program rather than a script. In this case, you can run the installation program in a new application root, and then use the DBMS_PDB_ALTER_SHARING package to set the objects to the appropriate sharing mode: METADATA, DATA, or EXTENDED DATA. The root automatically propagates the changes to the application PDBs. Oracle Database creates a statement log of the installation, so PDBs with previous application versions can be plugged into the application root. Some applications are defined in each PDB, but no application container exists. In this case, you can update the installation script to set the appropriate sharing mode. You create an application root, and then create the master application definition in this root. You can adopt the existing PDBs as application PDBs by plugging them into the application root, and then running a SQL script to replace the full definitions with references to the common definitions. For example, you can migrate an application installed in a PDB plugged into an Oracle Database 12c CDB to an application container in an Oracle Database 18c CDB. An application is created implicitly in an application root when an application common user operation is issued with a CONTAINER=ALL clause without being preceded by an ALTER PLUGGABLE DATABASE BEGIN statement. Application common user operations include operations such as creating a common user with a CREATE USER statement or altering a common user with an ALTER USER statement. The database automatically names an implicit application APP$guid, where guid is the global unique ID of the application root. An implicit application is created when the application root is opened for the first time. When you are connected to an application PDB, synchronize an application by issuing the ALTER PLUGGABLE DATABASE APPLICATION statement with the SYNC keyword. If you specify the application name before SYNC, then the database synchronizes only the specified application. If you do not specify the application name, or if you specify ALL SYNC, then the database synchronizes all applications, including implicitly created applications. When you are connected to the application root, the operations of installing, upgrading, and patching an application do not automatically propagate changes to the application PDBs. "Synchronizing Applications in an Application PDB"
A map table specifies a column in a metadata-linked common table, and uses partitions to associate different application PDBs with different column values. In this way, container maps enable the partitioning of data at the PDB level when the data is not physically partitioned at the table level. This table is intended to be queried using the container map. For example, you might create a metadata-linked table named countries_mlt that stores different data in each application PDB. In amer_pdb, the countries_mlt.cname column stores North American country names; in euro_pdb, the countries_mlt.cname column stores European country names; and in asia_pdb, the countries_mlt.cname column stores Asian country names. In the application root, you create a single-column map table partitioned by list, hash, or range. The map table enables the metadata-linked table to be queried using the partitioning strategy that is enabled by the container map. The names of the partitions in the map object table must match the names of the application PDBs in the application container. For example, the map table named pdb_map_tbl may partition by list on the cname column. The partitions named amer_pdb, euro_pdb, and asia_pdb correspond to the names of the application PDBs. The values in each partition are the names of the countries, for example, PARTITION amer_pdb VALUES ('US','MEXICO','CANADA'). Starting in Oracle Database 18c, for a CONTAINERS() query to use a map, the partitioning column in the map table does not need to match a column in the metadata-linked table. Assume that the table sh.sales is enabled for the container map pdb_map_tbl, and cname is the partitioning column for the map table. Even though sh.sales does not include a cname column, the map table routes the following query to the appropriate PDB: SELECT * FROM CONTAINERS(sh.sales) WHERE cname = 'US' ORDER BY time_id. A container map is a database property that specifies a map table. To set the property, you connect to the application root and execute the ALTER PLUGGABLE DATABASE SET CONTAINER_MAP=map_table statement, where map_table is the name of the map table. In this example, you log in as an application administrator to the application root. Assume that an application container has three application PDBs: amer_pdb, euro_pdb, and asia_pdb. Each application PDB stores country names for a different region. A metadata-linked table named oe.countries_mlt has a cname column that stores the country name. For this partitioning strategy, you use partition by list to create a map object named salesadm.pdb_map_tbl that creates a partition for each region. The country name determines the region. -- Create the metadata-linked table. -- Create the partitioned map table, which is list partitioned on the cname column. -- The names of the partitions are the names of the application PDBs. -- Set the CONTAINER_MAP database property to the map object. -- Enable the container map for the metadata-linked table to be queried. -- Ensure that the table to be queried is enabled for the CONTAINERS clause. -- End the application installation. Although you create container maps using partitioning syntax, the database does not use partitioning functionality. Defining a container map does not require Oracle Partitioning. In the preceding script, the ALTER TABLE oe.countries_mlt ENABLE CONTAINERS_DEFAULT statement specifies that queries and DML statements issued in the application root must use the CONTAINERS() clause by default for the database object. This example continues from the previous example. While connected to the application root, you switch the current container to each PDB in turn, synchronize the saas_sales_app application, and then add PDB-specific data to the oe.countries_mlt table. This example continues from the previous example. You connect to the application root, and then query oe.countries_mlt multiple times, specifying different countries in the WHERE clause. The query returns the correct value from the oe.countries_mlt.region column. "Partitioning by PDB with Container Maps"
A connection using a service name starts a new session in a PDB or application root. A foreground process, and therefore a session, at every moment of its lifetime, has a uniquely defined current container. The following graphic shows two clients connecting to PDBs using two different listeners. Description of "Figure 2-10 Services in a CDB"
When you execute the CREATE PLUGGABLE DATABASE statement to create a PDB, the database automatically creates and starts a service inside the CDB. Typically, a CDB administrator must have appropriate privileges to provision PDBs and connect to various containers. CDB administrators are common users. The default service has a property that identifies the PDB as the initial current container for the service. The property is shown in the DBA_SERVICES.PDB column. The default service has the same name as the PDB. The PDB name must be a valid service name, which must be unique within the CDB. You can create additional services for each PDB, up to a per-CDB maximum of 10,000. Each additional service denotes its PDB as the initial current container. When you create an application container, which requires specifying the AS APPLICATION CONTAINER clause, Oracle Database automatically creates a new default service for the application root. The service has the same name as the application container. Oracle Net Services must be configured properly for clients to access this service. Similarly, every application PDB has its own default service name, and an application seed PDB has its own default service name. In Figure 2-10, nondefault services exist for erppdb and hrpdb. Create, maintain, and drop additional services using the same techniques that you use in a non-CDB. For example, in Figure 2-10 the PDB named hrpdb has a default service named hrpdb. The default service cannot be dropped. When you switch to a container using ALTER SESSION SET CONTAINER, the session uses the default service for the container. Optionally, you can use a different service for the container by specifying SERVICE = service_name, where service_name is the name of the service. You might want to use a particular service so that the session can take advantage of its service attributes and features, such as service metrics, load balancing, Resource Manager settings, and so on. Connect directly to a PDB or application root. The user requires the CREATE SESSION privilege in the container. Use the ALTER SESSION SET CONTAINER statement, which is useful for both connection pooling and advanced CDB administration, to switch between containers. The syntax is ALTER SESSION SET CONTAINER = container_name [SERVICE = service_name]. 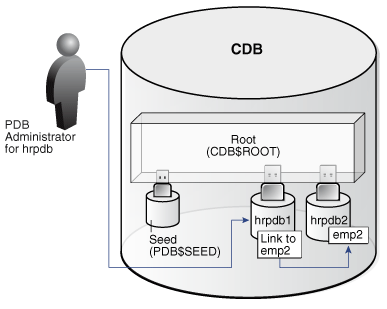 For example, a CDB administrator can connect to the root in one session, and then in the same session switch to a PDB. In this case, the user requires the SET CONTAINER system privilege in the container. The following table describes a scenario involving the CDB in Figure 2-10. Each row describes an action that occurs after the action in the preceding row. Common user SYSTEM queries the name of the current container and the names of PDBs in the CDB. The SYSTEM user, which is common to all containers in the CDB, connects to the root using service named prod. SYSTEM uses the SQL*Plus command SHOW CON_NAME to list the name of the container to which the user is currently connected. CDB$ROOT is the name of the root container. A query of V$SERVICES shows that three PDBs exist with service names that match the PDB name. Both hrpdb and erppdb have an additional service. SYSTEM uses ALTER SESSION to connect to hrpdb. A query confirms that the current container is now hrpdb. In this case, each PDB has its own undo tablespace. If a CDB is using local undo mode, then the database automatically creates an undo tablespace in every PDB. Local undo provides advantages such as the ability to perform a hot clone of a PDB, and speed the relocation of a PDB. Also, local undo provides level of isolation and enables faster unplug and point-in-time recovery operations. A local undo tablespace is required for each node in an Oracle Real Application Clusters (RAC) cluster in which the PDB is open. For example, if you move a PDB from a two-node cluster to a four-node cluster, and if the PDB is open in all nodes, then the database automatically creates the additional required undo tablespaces. If you move the PDB back again, then you can drop the redundant undo tablespaces. By default, Database Configuration Assistant (DBCA) creates new CDBs with local undo enabled. In a single-instance CDB, only one active undo tablespace exists. For an Oracle RAC CDB, one active undo tablespace exists for every instance. All undo tablespaces are visible in the data dictionaries and related views of all containers. The undo mode applies to the entire CDB, which means that every container uses shared undo, or every container uses local undo. You can switch between undo modes in a CDB, which necessitates re-starting the database. The primary physical difference between CDBs and non-CDBs is the data files in SYSTEM and SYSAUX. A non-CDB has only one SYSTEM tablespace and one SYSAUX tablespace. In contrast, the CDB root, each application root, and each PDB in a CDB has its own SYSTEM and SYSAUX tablespaces. Each container also has its own set of dictionary tables describing the objects that reside in the container. In a typical use case, each PDB has its own set of non-system tablespaces. These tablespaces contain the data for user-defined schemas and objects in the PDB. Within a PDB, you manage permanent and temporary tablespaces in the same way that you manage them in a non-CDB. You can also limit the amount of storage used by the data files for a PDB by using the STORAGE clause in a CREATE PLUGGABLE DATABASE or ALTER PLUGGABLE DATABASE statement. The storage of the data dictionary within the PDB enables it to be portable. You can unplug a PDB from a CDB, and plug it in to a different CDB. One default temporary tablespace exists for the CDB root, and one for each application root, application PDB, and PDB. This example shows aspects of the physical storage architecture of a CDB with two PDBs: hrpdb and salespdb. In this example, the database uses local undo mode, and so has undo data files in the CDB root, hrpdb, and salespdb. Description of "Figure 2-11 Physical Architecture of a CDB in Local Undo Mode"
RMAN and Oracle Enterprise Manager Cloud Control provide full support for backup and recovery in a multitenant environment. You can rewind a PDB using the FLASHBACK PLUGGABLE DATABASE command in SQL or Recovery Manager. This command is analogous to FLASHBACK DATABASE in a non-CDB. You can back up and recover a whole CDB, the root only, or one or more PDBs. You can also back up and recover individual tablespaces and data files within a PDB. 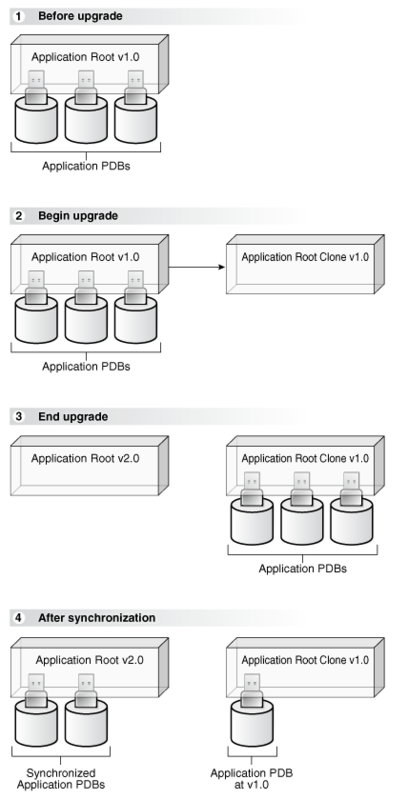 From the perspective of recovery, separately backing up the root and all PDBs is equivalent to backing up the whole CDB. The main difference is in the number of RMAN commands that you must enter and the time to recover. Recovering a whole CDB requires less time than recovering the CDB root plus all PDBs. You can perform complete recovery of one or more PDBs without affecting operations of other open PDBs. RMAN also provides support for point-in-time recovery at the PDB level. The procedure is similar to the procedure for point-in-time recovery of a non-CDB. Flashback PDB protects an individual PDB against data corruption, widespread user errors, and redo corruption. The operation does not rewind data in other PDBs in the CDB. In releases prior to Oracle Database 12c Release 2 (12.2), you could create a restore point—an alias for an SCN—only when connected to the root. Now you can use CREATE RESTORE POINT ... FOR PLUGGABLE DATABASE to create a PDB restore point, which is only usable within a specified PDB. As with CDB restore points, PDB restore points can be normal or guaranteed. A guaranteed restore point never ages out of the control file and must be explicitly dropped. If you connect to the root, and if you do not specify the FOR PLUGGABLE DATABASE clause, then you create a CDB restore point, which is usable by all PDBs. A special type of PDB restore point is a clean restore point, which you can only create when a PDB is closed. For PDBs with shared undo, rewinding the PDB to a clean restore point preserves database consistency and improves performance. The database avoids using the automatic infrastructure, which can reduce performance. In a non-CDB, you can use Resource Manager to manage multiple workloads that are contending for system and database resources. Therefore, in a CDB, multiple workloads within multiple PDBs can also complete for system and CDB resources. In a CDB, Resource Manager can manage resources on two levels: CDB and PDB. A CDB resource plan allocates resources to its PDBs according to its set of resource plan directives (directives). A parent-child relationship exists between a CDB resource plan and its directives. Each resource plan directive references either a set of PDBs or an individual PDB. A performance profile specifies shares of system resources for a set of PDBs. PDB performance profiles enable you to manage resources for large numbers of PDBs by specifying Resource Manager directives for profiles instead of individual PDBs. The directives control allocation of CPU and parallel execution servers. A directive can control the allocation of resources to PDBs based on the share value that you specify for each PDB or PDB performance profile. A higher share value results in more guaranteed resources. For PDBs and PDB performance profiles, you can also set utilization limits for CPU and parallel servers. You can create a CDB resource plan by using the CREATE_CDB_PLAN procedure in the DBMS_RESOURCE_MANAGER PL/SQL package, and set a CDB resource plan using the RESOURCE_MANAGER_PLAN parameter. You create directives for a CDB resource plan by using the CREATE_CDB_PLAN_DIRECTIVE procedure. A CDB resource plan allocates a portion of the system resources to a PDB. A PDB resource plan determines how this portion is allocated within the PDB. Create a PDB resource plan in the same way that you create a resource plan for a non-CDB: by using procedures in the DBMS_RESOURCE_MANAGER package to create the plan. You can create a PDB resource plan by using the CREATE_PLAN procedure in the DBMS_RESOURCE_MANAGER PL/SQL package, and set a PDB resource plan using the RESOURCE_MANAGER_PLAN parameter. You create directives for a PDB resource plan by using the CREATE_PLAN_DIRECTIVE procedure. In a CDB, PDBs may contend for SGA or PGA memory. Several initialization parameters can control the memory usage of a PDB, either guaranteeing memory or limiting memory. When you set the following initialization parameters with the PDB as the current container, the parameters control the memory usage of the current PDB. SGA_MIN_SIZE sets the minimum guaranteed SGA size of the PDB. SGA_TARGET specifies the maximum SGA that the PDB can use at any time. PGA_AGGREGATE_LIMIT sets the maximum PGA that the PDB can use at any time. Intensive disk I/O can cause poor performance. Several factors can result in excess disk I/O, such as poorly designed SQL or index and table scans in high-volume transactions. If one PDB generates excessive disk I/O, then it can degrade the performance of other PDBs in the same CDB. MAX_IOPS limits the number of I/O operations for each second. MAX_MBPS limits the MB/s for I/O operations. For Engineered Systems, manage PDB I/Os with I/O Resource Management. "Using Oracle Resource Manager for PDBs"